Electronic music pioneers Kraftwerk released their album, Autobahn, over 4 decades ago now in 1974. Several more albums of repetitive rhythms, vocoder voices, synthesisers and drum machines that gave them their distinctive "robot pop" sound followed until 2003, when they released their final album, Tour de France Soundtracks. This year Stage 1 of the Tour de France cycle race, a time trial, will pass the old Kling-Klang studio in Dusseldorf where the cycling enthusiasts of Kraftwerk recorded their most famous music. Although no longer performing as the classic Kraftwerk line-up, most of the current band have been performing together for over twenty years now, with Falk Grieffenhagen the newest member. Usually performing as a uniformly clad, austere foursome, their appearance has always been as distinctive as their sound, with shop mannequins, robots and large projections being recurrent elements of their performances. Rarely giving interviews and performing with earnest personas, their aloofness has stood them in good stead, and matches the industrial, cold themes of a lot of their songs. Their influence on everything from hip hop to Coldplay (Computerlove is the basis of their song Talk). 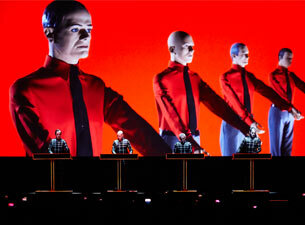 Since 2008, only Ralph Hütter of the original line up still drives the Kraftwerk brand onwards around the globe. They have remixed the back-catalogue and repackaged their look to tour over the past couple of years as a 3-D audio-visual extravaganza. One question that I had coming to their show tonight (I am struggling to call it a concert) was how much do they bring to the performance? How much do they add standing, staring at lecterns whilst electronic music and projected visuals bring the entertainment? The answer was a resounding "loads!". The Royal Concert Hall in Glasgow is a comfortable, seated space, more used to hosting classical concerts, but I have seen great shows here from musicians as diverse as Billy Bragg and Mogwai. 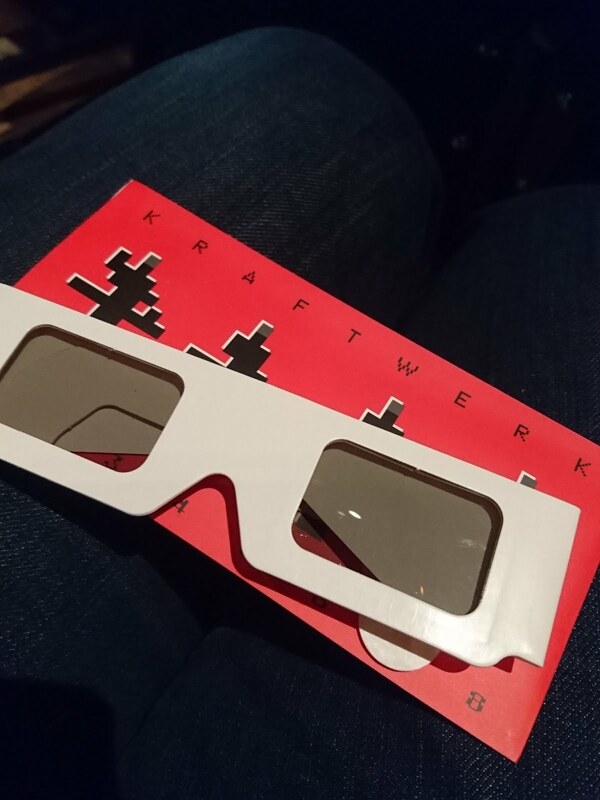 On the way in we are all given our 3D glasses to enjoy the show's visuals, a wee problem for me and my bespectacled brother, particularly for him as he has poor 3D vision due to an eye problem. Due to our original seats being so far round to the side that the stage as it has been set up would have been unseen by us, we were moved to seats in the third row of the stalls, which was a wee, pleasant start to the night. The curtain pulls back to reveal the four performers at their pedestals, heads down, earnestly noodling away all night. Only as they walk off one at a time after a brief solo, does it become apparent what each musician is contributing to the mix. For about 90 minutes we are bombarded with a string of all their well known material, complimented by a dazzling variety of visuals on the screen behind them. Compuerlove (1981) predicts the world of Tinder and on line dating, other songs again play with ideas ahead of their time, with sounds nobody else was creating. The sincere way in which it is all performed creates a visual atmosphere of being in a modern art gallery at an exhibition. Their tight fitting bodysuits, with wire-frame model highlights look like we have entered a real life version of the 1982 film Tron. It is hard to pick out highlights in the setlist as so many fabulous tunes wash over us; Neon Lights, The Man-Machine, Spacelab (complete with a 3d spaceship which seemed to crash into the guy in front of me in my mind's eye before it is shown on screen flying over the River Clyde and landing outside the concert hall), Trans-Europe Express. The first encore finds the stage taken over by the red-shirted robots, spooky and bonkers, like a mad 1970s episode of Doctor Who. The mask doesn't slip, they play it straight right to the end, and leave the stage to thunderous applause to the fading sounds of Musique Non Stop. A fantastical and unique show. Not just four old blokes staring at computers after all, but a good old fashioned son et lumière, performed by Constructivists with some banging tunes.